Athletes who suffer an adductor strain typically complain of pain in the groin and inner thigh. Typically the athlete notices immediately that an injury has occurred and is able to localize the pain to the top of the inner thigh. Often a physician, upon examining a significant injury right after it happens, will notice a defect if the muscle has torn. Most of the time no defect can be felt, and only pain and weakness with attempts to bring the thigh across the body (adduct) against resistance can be demonstrated. 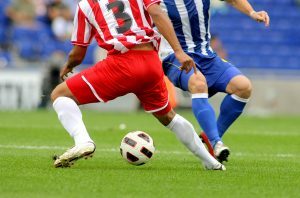 A sports medicine physician will often order x-rays of the pelvis and hip to ensure that the athlete did not pull a small piece of bone off during the injury. Occasionally the physician will order an MRI. The MRI will show which muscle and tendon is involved, which is most commonly the adductor longus. The MRI can also help demonstrate the extent of the injury and help to estimate the length of time it will take for the athlete to recover and get back to sports. It can also help to rule out injuries with similar presentations, such as athletic pubalgia (“sports hernia”). As with most tendon and muscle strains, treatment is almost always nonoperative. Rest from the offending sport and ice to the area can be helpful. As the pain and swelling improve, cardiovascular exercise that does not stress the adductor, such as a stationary bike, can be helpful. As the athlete continues to improve, he or she will start jogging before progressing to a sport-specific rehabilitation program. Working with a sports physical therapist can help tremendously. Return to sports is likely, but it can be difficult to estimate the length of time prior to full recovery. Occasionally the athlete will get back in 1 to 4 weeks, but occasionally it can take 6 to 8 weeks or more.